Electrical Services in Montclair, NJ | Anderson Electric Corp.
Electrical work is some of the most important utility and contracting work around. We live in a world utterly reliant on electrical power in order to function, from the largest cities to the smallest apartments. If your Montclair electrical system is in good shape, chances are the rest of the systems in your home will be that much better off, and you won’t have to worry about electrical shock or house fires. However, you must find an electrical contractor that you can trust to maintain, update, or install your electrical system. You should never attempt your own electrical work. 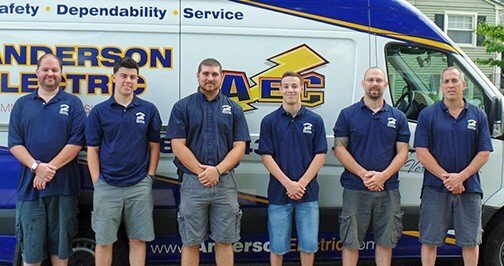 The licensed, fully-trained, and experienced electricians at Anderson Electric Corp. understand your needs, and we are here to provide quality work with the results you are looking for. If you need a new electrical system installed, an inspection or repair, electrical maintenance, or even rewiring, we can help you out. Call today to schedule electrical services in Montclair, NJ and the surrounding area. Reached out to Anderson Electric to install a stand-by generator. Totally responsive, courteous, informative, and professional. Did a great job. Knob–and–Tube Elimination: Our specialty is eliminating old, dangerous knob–and–tube wiring and making Montclair homes safer. Invented in the late 19th century, and almost entirely abandoned by the mid–20th century, knob–and–tube wiring involves suspending wires from knobs inside the walls of the home. Though convenient for its time, this method of wiring was also incredibly dangerous due to the quality of insulation and the age of the installation. If you live in an old home that uses this kind of wiring, call us right away to transfer over to something safer and more efficient. Electrical Panels: Fuse boxes and circuit breakers are designed to divide up power in the home and protect against power surges in the electrical system. When there is a sudden overload on a circuit, the electrical panel is what stops the surge from causing any serious damage. We install and upgrade electrical panels, and we can provide service as needed. Electrical Wiring and Rewiring: The wires that an electrical system uses are incredibly important; there wouldn’t be much of a system without them, after all. Whether you’re having an entirely new house built, making renovations, or just need to replace some old wiring, we offer comprehensive electrical wiring services for any home or business. Electrical Repairs: All electrical systems develop the occasional issue, and it’s not usually safe to attempt repairs on your own. Call us if you notice anything wrong with your electrical system, such as flickering lights, frequent problems with the circuit breaker, or anything that seems potentially dangerous. Indoor and Outdoor Lighting: Lighting is an incredibly important part of a home, whether for safety, or security, or aesthetics. We can provide for all of your indoor and outdoor lighting needs. We believe that keeping your electrical system in good shape is one of the best things you can do for your home, and we’re determined to make it easier on you. Our expert electricians are on call for all of your electrical needs. And we provide timely, quality, personalized service every time. We have 20 years of experience providing electrical services throughout Montclair, NJ, so call us today with any questions you may have, or to schedule an appointment.